Gold never really goes out of style, and for good reason too. Gold jewelry, for example, is beautiful, dazzling, and wearer-friendly. Gold coins and bullions, on the other hand, have a lot of intrinsic value and can have a significant worth if they are collectible. Gold is a precious, highly-valued metal that is long lasting and retains its value over time, so buying most gold pieces is considered an investment, so to speak. With as valuable as some gold pieces are, hanging on to any unused, unwanted, or broken gold items doesn’t make much sense. Instead, you could sell your gold items and get paid in cash! At The Gold and Silver Exchange, we are one of the few places that buy gold in any condition! Whether you want to sell gold online or in store, our gold buyers will offer you an honest and fair cash payout! If you are on the fence about selling used gold jewelry, coins, and other items, check out some of the benefits of selling your unused or unwanted gold to our professional gold buyers. 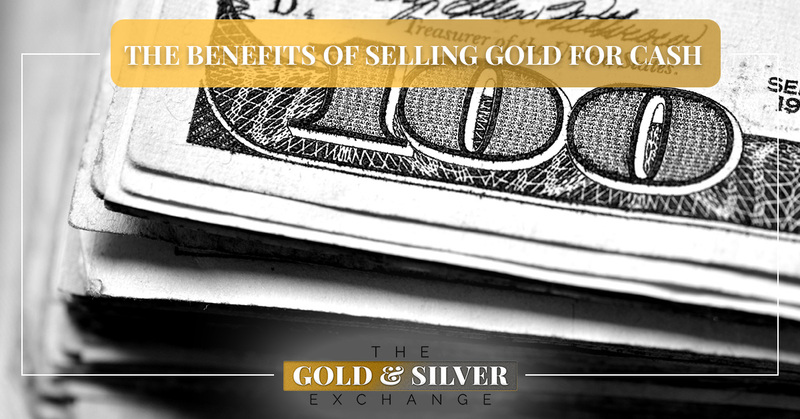 One of the most obvious benefits of selling your gold is getting extra cash. Whether you are trying to save up money to purchase a new home or go on that long overdue vacation, selling your used or unwanted gold items can help you do so quickly! In addition, if you are in need of some emergency money, selling your gold is a way to quickly fill your wallet up. Maybe you are in need of car repairs after an auto accident or have an unforeseen tragedy take place — regardless, selling gold can help you make the extra cash that you need! Do you really have a reason to keep any broken necklaces, unwanted or unused gold jewelry, or other gold items sitting in your drawer? These valuable items are not of much value when they are just sitting around and collecting dust. Instead of letting them just sit around, get cash for gold! The cash you make off of any unused or unwanted pieces can be used towards monthly bills or it can be used to replace them with newer gold jewelry or pieces. The Gold and Silver Exchange makes selling your gold simple and hassle-free. Our gold buyers can appraise your gold and offer you a fair and honest price in just three easy steps. First, our gold buyers carefully evaluate the items you are selling. We then separate the items and weigh them to offer you an accurate price for your item and will pay you on the spot. Unlike other local gold buyers, we don’t pressure you into selling any items — if you don’t like the offered price there is no obligation to sell! Currently, the price of gold is at a good spot. Selling gold for cash has always been appealing, but it just so happens that its current price is quite high and is likely to only get higher. Although gold prices can take a dip from time to time, it typically is always steadily rising in price. You do not want to miss out on making a significant amount of cash, so selling any broken, unused, or unwanted gold pieces can have a great payoff. If you want a rough idea of how much your gold is worth, bring it in for a free evaluation. As you can see, selling your gold can really pay off! If you have any gold you want to get rid of, at least make some money doing so. At The Gold and Silver Exchange, we buy and sell gold pieces, from gold coins and watches, gold jewelry and rings, and so much more. If you want to sell your gold, contact our friendly gold buyers today!